the strengths of the Data Vortex Network. Each system contains the revolutionary, patent-protected Data Vortex interconnect technologies: the Data Vortex Switch Boxes and the Vortex Interface Controllers (VICs). The system is also equipped with traditional Ethernet and Infiniband networks to support legacy software and ease connections to external data. Each DV VIC in a typical system (such as in a DV206) contains sixteen 8 Gb/s SerDes. Each of the VIC’s SerDes are connected to a separate radix 64 Data Vortex switch chip. The result is a total of 16 Data Vortex switch chips operating in parallel where every switch chip has its own connection to every DV VIC. Plexus Corporation has played a key role in the development, manufacturing, and delivery of Data Vortex products. This ITAR-compliant, American-based company is committed to excellence at all levels of the process from engineering through manufacturing. Working side by side our teams have made our differentiating designs a market-ready reality. Q: Within the context of a Data Vortex computer, what makes up a compute node? 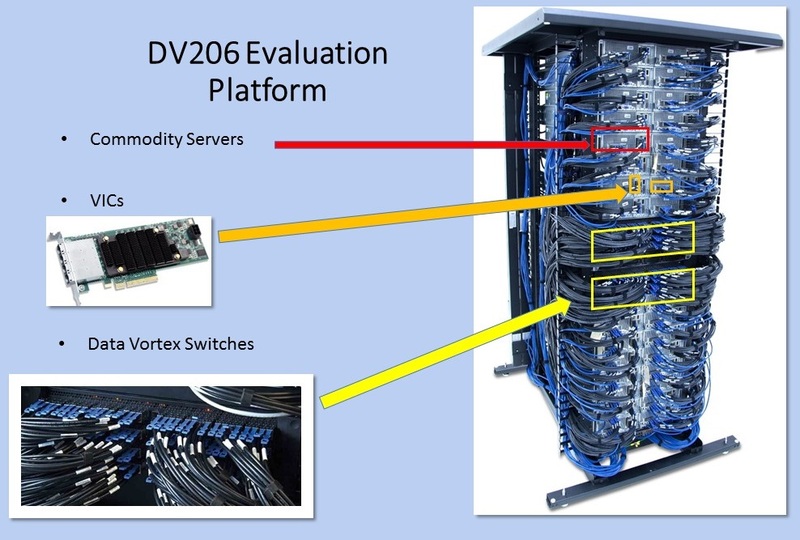 A: The compute nodes used in current generation Data Vortex systems are Intel-based, Off the Shelf/commodity servers. Each server is populated with either one or two high-end Intel Xeon processors. Each processor has 128 GB of DDR DRAM for local application usages. Vortex Interface Cards (VICs) are installed into the servers so each CPU has its own network interface. Additionally, each compute node has an InfiniBand card to support porting legacy software that relies on InfiniBand technology. Q: Is the Data Vortex network chip set built with FPGAs or custom ASICs? A: Current generation Data Vortex Switches and VICs are built with Altera Stratix V FPGAs. Next generation Data Vortex network chip sets will be built with Alter Stratix 10 FPGAs. The future Data Vortex network design road-map is available under non-disclosure. Q: How large can the current generation of Data Vortex computers be built? A: In the current generation, 1-level systems are scalable up to 64 nodes (DV202 – DV206). 2-level systems are scalable up to 2,048 nodes (DV207-DV211). 3-level systems are scalable up to 65,653 nodes (DV212 – DV216). The Data Vortex 2-level switch has been designed and implemented. Our 1-level vs. 2-level system performance comparisons run on our 2-level test bed platform show that as we grow levels and nodes, applications do NOT take a large performance hit as other systems do. Q: Is there a Data Vortex Users Group? A: Yes. The Inaugural Data Vortex Users Group will be hosted by Pacific Northwest National Laboratory in September, 2017. All attendees must be under non-disclosure with Interactic Holdings, LLL | Data Vortex Technologies, DBA. Q: What OS does the system run? Q: What scheduler is used? Q: How is the system managed? Q: How is the user environment managed? A: Lmod, a Lua based module system. Q: Does the system support mixed mode programming? Q: What is the default compiler?